With so much information out there, it&#x27;s nice to have these experts keeping it in one place. With the combined efforts of powerhouses Jean Ann Van Krevelen, Amanda Thomsen, Robin Ripley, and Teresa O'Connor you are getting a serious explosion of information on bringing your vegetable gardening from the ground to the table. These four in-the-know social media marvels let you in on their secrets of growing, harvesting and recipes for more than 25 fruits, vegetables, and herbs. Focusing on Gen X & Y, and beginning gardeners these ladies have a book that is packed full of great tips and recipes. Best part? Becoming a part of a community of their 80,000 followers who turn to them for all kinds of gardening advice. SO if you are a beginning gardener and looking for the perfect book to inspire your future garden, this is the one you gotta get. 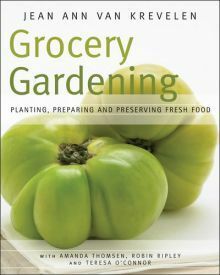 Go to gardenbookstore.net for more on GROCERY GARDENING. Very inspiring...especially after watching the movie Julie and Julia...cooking and gardening go hand-in-hand!!! Oh Santa - bring me this for Christmas!